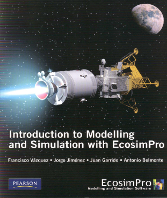 Pearson-Prentice Hall has just released a new book on EcosimPro entitled Introduction to Modelling and Simulation with EcosimPro, authored by F. Vázquez, J. Jiménez, J. Garrido and A. Belmonte of the University of Córdoba in Spain. The book contains good introductory material for new users of EcosimPro in the areas of dynamic systems modelling with equations and reuse of existing libraries in the control, mechanical, electrical and thermal libraries. It also provides a good overview of the algorithms used internally to produce robust mathematical models. The final chapter is devoted to using EcosimPro models from other environments such as Excel, Matlab and C++. This new introductory book on EcosimPro has 260 pages and is structured in 6 chapters: EcosimPro and the Object Oriented Languages, First Steps with EcosimPro, Construction of Libraries, Reuse of Existing Libraries, Mathematical Algorithms and Connection with Other Software.